After a lot of hype, Nokia recently launched it;s X series phones which are based on Android. This is an highly talked about event as Nokia is now owned by Microsoft and Android being based on Linux is a direct competitor. It is said that the leaks regarding the Android based Nokia phones started coming out before the Nokia – Microsoft takeover deal and Nokia had no choice but to release these phones looking at the dipping sales figures. Nokia released 3 Phones under the X series, namely Nokia X, X+ and XL. Thought these phones are Android based, they are based on the AOSP (and not the very latest Android version) 4.1.2. Adding to this, the Android OS on these phones is highly modified and supports only Microsoft services (like Outlook.com, Microsoft OneDrive, Skype and Nokia Here Maps to name the few). It also does not support the Android’s usual icon based custom launchers and sports its own Nokia X launcher (which is similar to the Lumia devices). All this calls for unhappy Android users and developers who always ask for more. In a few days after the launch, a guide to rooting the Nokia X was published on XDA-developers user Kashamalaga. The hack is pretty simple, First root the device using an exploit (Gandalf exploit in Framroot), then install a root file manager and then install the Gapps created by Kashamalaga for Nokia X, do some housekeeping (adding permissions, etc) and reboot. 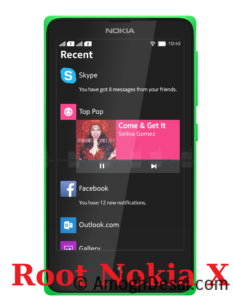 You have a rooted Nokia X with Google Play store ! Nokia has locked the bootloader and developers has not been able to unlock it till now, so it is not possible to update the Nokia X to the latest Android version yet. I will keep updating this article. For now lets see in detail, How to root the Nokia X, X+ and XL. Disclaimer: Please do this at your own risk, Rooting or following any steps from this article will void your warranty (You can easily unroot the phone if you are going for a service or repair). If you do it wrong, you may brick your phone. I should not be held responsible for any such issues. Root your device. Download Frameroot.apk and run it. Once the apk is installed, open it. From the dropdown, select SuperSU and click on Gandalf. It will do its magic! once finished, Reboot your device. Your Nokia X device is now rooted. Now, download and install a root explorer (Paid Root Explorer or Free Root Browser), Everybody recommends the paid Root Explorer (I don’t know why ??). I feel the free one is just fine. Open SuperSU and provide root permissions to Root Explorer (or Root Browser). Now download The Google services APKs (GPS, etc.). Extract and copy them (don’t install, only copy) to /system/apps folder using Root Explorer. Accept the default file permission when prompted. Then, download Gapps and install them one by one. You will now see all the google app icons. Install the apps and enjoy the Google Play store ! This guide is based on Kashamalga’s guide. I have tried to make it simple to understand and as detailed as possible. I will further post how to unlock the device as and when an update comes. In the meanwhile, leave your comments if you were successful in rooting your Nokia X or if you have any suggestions. This post is an unfinished article and will be kept updated as progress is achieved. Sir Ian using Nokia x & I / want to install Gapp but framaroot is not working in our phone what will I do? first u need to download the nokia x tool kit which was developed by ethan to ur pc.Run the setup and there are so many options select root and press enter.connect ur mobile to ur pc by usb debugging.it will automatically rooted ur mobile.In the same way their is a gapps option in tool kit install gapps.